Usually the man proposes. If the couple decides to have a church wedding/ boda and reception then the bride's family mostly does the preparations. Weddings can be expensive and so some people choose to have smaller gatherings or just marry in civil court. As of January 2012 The Central Electoral Board (JCE) has trained pastors representing non-Catholic religious denominations to celebrate weddings including the Iglesia Asamblea de Dios, Asamblea de Iglesia Pentecostal, Concilio Cristiano, Iglesia Apostolica Misionera, Iglesia Adventista del Septimo Dia, Concilio Menonita, Iglesia Metodista Libre, Dios de la Profecia and Asamblea Cristiana. In the past only a Catholic Church priest could marry a couple. and followers of other Christian religions had to go through a civil marriage process with a Justice of Peace. In the past anyone wanting to marry outside of the Catholic faith ad to marry in a Civil Court of Judges Chamber before the large ceremony so they can have all the legal documents. Then have a church wedding. The couple would marry in civil court or in a judge's chamber the morning of the wedding or even the day before the actual church wedding. Bridesmaids and large wedding parties are not the norm here. Having a cute little ring bearer and flower girl is. Many times they dress the same as the bride and groom, in smaller scale. Having "padrinos and madrinas" (godparents of the wedding) is very traditional. The godparents are usually the mother of the groom and the father of the bride and their role is to serve as witnesses. Along with the couple, the godparents also sign the marriage certificate. Another tradition is to have a child (usually a boy) carry the "arras" or coins on a silver tray. The boy would have 13 coins (they are usually 10 cents coins) that at some point during the ceremony will be passed to the priest. The priest will pass them to the groom and he in turn will pass them to the bride. This exchange signifies that the couple pledges to provide for each other and that material goods are to be shared equally. The whole thing is very symbolic and is quite romantic. In addition to the flower girl, the ring bearer and the coins bearer, we also have a child that carries a fancy white bible. The mother of the groom with the groom escorting her enters the church first. The mother of the bride then enters escorted by the father of the groom. The wedding party enters next including the children, usually entering in pairs. Another Dominican tradition is to have what is called a "ceremonia cantada" meaning that every piece of music was actually sung, instead of being just instrumental. It used to be that Dominican wedding receptions consisted mostly of cake and champagne, along with light appetizers at best. Today, sit down dinners are the style. Usually, there's a bachelor party/ despedida de soltero and what you call a bachelorette party/ despedida de soltera. There is also the usual bridal shower. The vast majority of Dominicans deliver their gifts to the bride's home before the wedding day. Never take a gift with you to the wedding ceremony or reception. The church is usually not divided into "bride's" and "groom's" sides. So you can sit where you would like. At the end of the liturgy, a large number of people go to the altar. These are witnesses, and there could be dozens. Asking someone to be a witness is a way of honoring them as a special guest. Many family members and friends will be included. The bride and her father have the first dance. The groom and the bride's mother join them. Then the entire wedding party and family enter the dance floor. After this then the guests can start dancing. The wake continues until 12 noon the next day, followed by burial at the cemetery. It is the family's choice to retire at midnight and return the next day around 7 am. More information about the historical Cementerio Nacional de la Avenida Independencia/ National Cemetery Avenue Independencia and a Cementerio Nacional picture slide show. Most newlywed couples will stay until the end of their party, which could last til 3 AM or later. They are never the first to leave. So if you want to leave do not hesitate to leave before the bride and groom. Any time after the meal is socially acceptable, although you are likely to miss quite a party. 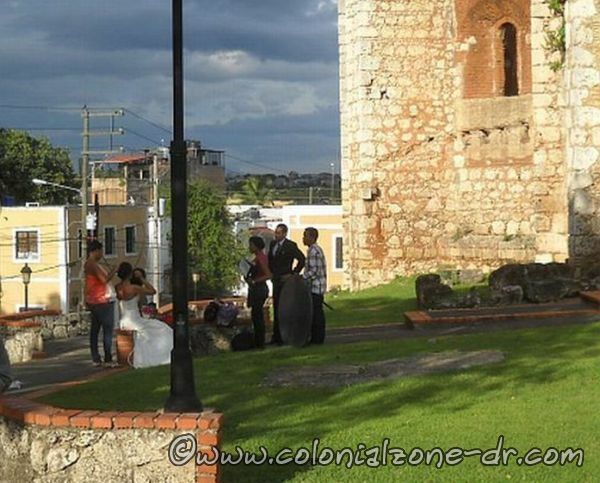 +click to enlarge Taking wedding pictures at the Ruinas del Monistario San Francisco under dark skies. Many families follow on with a series of memorial masses held for nine (9) consecutive days. This is known as los nueves dias, novenario, or la vela. When and where they will be held will be announced. It is not necessary to go to these masses unless you were a close friend of the person or family, especially if you attended the funeral. One is never expected to attend all the masses unless you want to do so. If you were not able to attend the funeral you should go to one of the masses. You might choose to go to the last one that usually will be announced in the press. This marks the end of the mourning period ceremonies. To "cumplir" is to act in accordance with the standard social procedures. A person will go to a funeral whether or not it is his desire; it is his duty. To "cumplir" is important in this society. It signifies respect and caring. 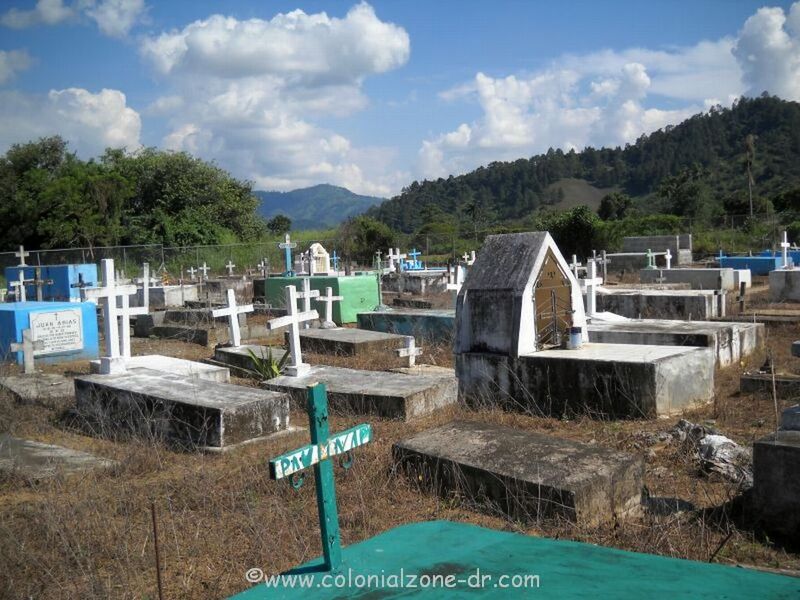 Dominicans show much respect for their dead. A funeral is an event that will gather people together, including family members, who may not have seen each other for a number of years. Inside the chapel it is sedated but outside, there will be a lot more liveliness almost reminiscent of a normal social occasion. 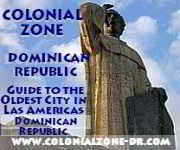 Continue on to PAGE 2 Dominican Republic Traditions.